Another fake persona complete with stock photography who’s made millions of dollars online doing next to nothing and now wants to share “her” secrets with you. The truth: data entry scams are making a comeback with a new name. “Jennifer Smith” is claiming that there’s a new work at home job out there that will make you rich. “She” drones on and on about how she quit her job, makes millions of dollars, and generally spends her time lounging around on gigantic piles of money. Now she wants you to come work for her. There is very little mention of what type of work you’ll be doing outside of the faux-job title “Search Engine Agent.” What does a search engine agent do? According to Jennifer, he or she gets paid $15 per link they post to Google. It takes about 4 minutes to post a link. Assuming you work the average 8 hour work day, you’ll make $1,800 per day posting links! What’s not clear about that? And you can have your investment back in just One Day! By posting 15 links in 60 minutes you can make $225, so that means in your first 60 minutes you can make back your one-time investment of $49.95, and already be $28 ahead! More so, by posting 15 links in 60 minutes a day…5 days a week…you can put $58,500 year-after-year into your bank account, so the financial value you’re receiving is enormous! Think about it, you invest $49.95 once, and you receive back $58,500 over and over again! $225/hr doing something simple like posting a link. Sounds pretty good right? You have to pay a lot of money to “post a link to Google.” I’m talking hundreds or even thousands of dollars per day. To see any sort of return, you’re going to need extensive knowledge in pay-per-click marketing. You don’t simply buy ad space and make hundreds of thousands of dollars. That’s just not how advertising works. I’ve covered this type of scam hundreds of times in the past. I have nothing new to add and to be honest, I’m sick of talking about it. However, I do want to point out one last thing. The sales page does get a embarrassingly sloppy towards the end. This clown signs the end of the letter with the generic name, Jennifer Smith. Immediately following the signature, they use the name Judy in a headline instead of Jennifer. This scammer can’t seem to decide on what fake name to use. Is At Home Income Source a Scam? It’s 100% absolutely a scam. It’s the same data entry scam we saw all those years ago. It’s just repackaged with a new name, new pictures, and new stories; however, it still DOES NOT WORK. Do not buy into the hype because you will lose a TON of money. Do not join AtHomeIncomeSource.com and stay far away from anyone who tells you that you can become rich posting links online. BEWARE!!! Kelly Scott’s “Replace your job.com” SCAM!!! Fortunately, I did not buy into this outrageous SCAM! But just word for the wise ALWAYS go to the bottom of a website and read their DISCLAIMER statements they are enlightening!!! Is Work At Home EDU a scam they are asking for $97.00 and a 2 month trial and you will get your money back? Oh, and she also checks availability in your city. It comes back saying there is only 3 positions left out a total of 15 in each city accepted. So it gives you the idea you better hurry and get this deal at this price. Very manipulative! Thanks for having a site like this! Has anyone heard of Michelle Withrow with WAH University or Work At Home University? She claims the same as Jennifer Smith and the link posting agent that you will be a millionare for the very low low price of only $97. I just about bought into it and I just was scammed for $400 for a deposit on an apt near where I live two weeks ago! What the hell is wrong with me! I guess this time at least I researched this ad. She has a video on the site supposedly from NBC. Also, advertises that her certification course is shown on CNN and some other well known news stations. Is she a scam as well? Im sure she is but how can these people get away with using these big names of others? I just wanted to say “THANK YOU!! !” for saving me $97!!! They are now calling themselves ‘Cindy Carter’ and the site is ‘Online Profit Stream’. Glad I had the forethought to do alittle searching before I signed up, I really need the money (like so many other people) but the mis-spelled words made me think twice. If is seems to good to be true… IT IS!!! Thank you again!! That means it will show your city for Melissa’s city. I think these sites sell you some ebook and that explains on how to create a website and then put Google adsense ads on it. As users of your new site click on these ads, you make money. Biggest question is: How do you get millions of visitors to your site? And how much money you need to spend to get those visitors? Hello, i saw an add in google about something similar , the name is Melissa Johnson and the company is called ‘Home Source for Earnings’. Is that the same company ? Could you check it out and tell me if it’s a scam ? Is Free lotto a legitamite business? What is a legit online business with lots of support to join? This scam has been going for ages. Sometimes they somehow take over other’s emails and you think it has been recommended by one of your friends. So beware! 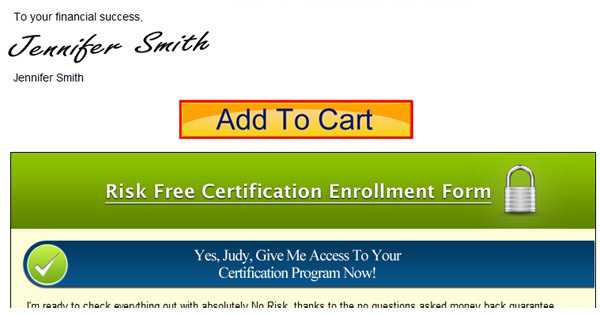 Hi there, yes I was looking at Jennifer Smith and Mack Chase’s website, and I was nearly tempted to buy into that crap. Thank goodness I saw this important bit of information, thank you! thank you! thank you! We would certainly be a lot poorer, depressed and disappointed if it was not for people like you looking after people like us. I will admit that I fell for it….$97 poorer now. Wow! Thank you so much for all this wonderful information Steve. This post enforces the meaning of the word “scam” associated with these types of offers. I’ve been getting these “scammy” emails in my inbox under the names, Judy/Jennifer/Mark, etc., and have been ignoring them all because it sounds too good to be true. No one wants to fall for these scum-bags when they swindle innocent victims out of much needed money, I truly don’t know how these folks sleep at night? Thank for posting and doing the right thing Steve, you ROCK! Shucks Steve, Jennifer/Judy/whomever couldn’t even get the math right. Posting 15 ads at $15 each in one hour ($225.00) would return the initial investment ($49.95) plus $28??????????? Seems more like $175.05 should be left over. Or perhaps the $28 is what is left AFTER Jennifer/Judy/whomever finishes fleecing the unwitting participant!! Is Project Payday a scam? You may have talked about this but I did not personally see the post. I feel like there is really no honest people in this business of making money from home. Most of the offers I see are scams. Since I have been looking for a job I have received many e-mails about you must pay to work for them and I ignore most of them. The other day after responding to a work from home ad I received a phone call from a person that was very pushy telling me that for a one time fee of $200 he would set up a free website with hosting included for life. The only thing I had to pay for was advertising my site. His offer was to set up a website for Amazon products. He said that most people think Amazon just sold books. The only thing I had to do was pick the name of my site and they would keep my site updated with current products so I did not have to waste my time when products that were discontinued. I told him that I could do this without his help. He then changed the price to $155 if they could share a commission off the products I sold. He then told me if I could not make a decision before I got off the phone this one time deal was off. This caller only had a mall website with Amazon products to sell to show me. Wouldn’t he have profited by my hard work by getting commissions from supplying hosting, website and product sales. Advertising is the most costly part of what he was selling me right?